Trekking to the mountains is a passion of many adventure lovers. It begins with a single step and slowly and gradually as we put one foot in front of the other, we push our body and our mind to reach places that very few people have ever been to. Trekking not only takes us to special Godly abodes but also helps us know our strengths and weaknesses. Out of all the places in the world, trekking to Everest Base Camp (the base of the world’s highest mountain) is the most special of them all. 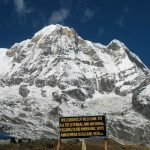 The world’s highest mountain enchants fellow trekkers and adventure lovers from all around the globe. Early March to Mid May and early September to mid November, there is madness on the trail to Everest. Large groups of trekkers religiously move up and down the hills like an army of ants. They ascend and descend hills, cross long scary suspension bridges and slowly make their way higher and higher only stopping for meals and accommodation in the many cozy tea houses on the trail. 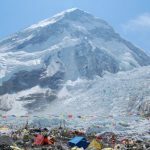 Trekking to Everest Base Camp- what is it like every day? Try and get a window seat, if possible on the left side of the airplane for spectacular views. From Lukla, it’s a completely different world. One will not hear the usual hustle and bustle of the city, no vehicles are in sight. It feels like we have come to the womb of Mother Nature, birds chirping, wind howling, cute little stone huts and enormous mountains all around. From here time travels backwards. Everything is transported either through mules and mountain horses or by porters. The trek begins from this iconic town, slowly walking along the Dudh Koshi River. Every nook and corner of this trail provides a perfect opportunity for a photograph and the landscape dramatically unfolds before our eyes as we slowly make our way to the next stop- Phakding(2610m). Phakding is also a UNESCO world heritage site, so if you reach early, try and take a walk around this small town and soak in some culture of the Sherpa community. There are also some quaint little western bars where you can go shoot some pool and release some steam in the evening. You could also try the local Dal bhat for dinner and some local rice wine to gulp it all down. You will need the Dal bhat power for the following day as the walk to Namche Bazaar is gruesome and tiring. Begin your day early as the walk from Phakding to Namche Bazzar is steep and you will gain at least 900m in elevation, which is a lot for a day. Phakding is situated at 2610m and Namche Bazzar is at 3440m. The really fun part, which is also the scary part, is crossing high suspension bridges which connect two or more hills. If it’s windy, it’s even scarier as the bridges wobble and shake, making your heart beat faster. The last 30 minutes or so before reaching Namchee Bazzar is a straight uphill climb which will definitely take a toll on your body. Tread carefully on the last stretch. Soon you will come to a clearing and start getting glimpses of the houses on terraced fields of the mountains, this is nothing short of a dramatic movie scene. Welcome to the Sherpa capital! On the trail, your constant companions will be many porters with heavy loads on their back, there will also be yaks and horses. Although these are gentle creatures, be very mindful when they are approaching from either ends. Do not stand on the edge of a cliff to let them pass, always stand on the opposite end where there is some support. On the many suspension bridges that you will be crossing on the trek, always let the animals pass first, especially if they are coming from the opposite direction. Although Namche Bazzar sits far away from civilization, there is nothing one can’t get here. From high speed internet to continental and European cuisine, they have it all. Worth mentioning is the bakery cafes that they have here. Apple pies, strawberry cakes, homemade bread, croissant, pastries and many more are made fresh in the world’s highest bakeries. Many trekkers halt here for a day or two to acclimatize before moving up ahead. It may be a good opportunity to fill in some essential gear that has been left out and also treat yourself to a pastry or two to boost your motivation. While you are on your rest day, you could also hike to a nearby village of Khumjung(3790m). A monastery in khumjung contains a purported yeti scalp. The view of the mountains from this village is also magnificent. When you are ready to move forward, pack your bags and start ascending towards Tengboche(3870m). The trail is pretty simple with a few ups and down and again a few suspension bridges to cross. On the trail you will also get your first glimpses of Everest and the magnifique’ Ama Dablam’(the most beautiful mountain in the world). Tengboche sits under the shadow of Ama Dablam and is also home to the oldest monastery in the Khumbu region. One can camp on the open bugyal of Tengboche surrounded by tall mountains on all sides or simply choose to stay in one of the teahouses. If you want to experience Tengboche at its most colorful period, plan your trek during the MANI RIMDU FESTIVAL. It usually falls between mid October to mid November. After a night stop here, head towards Dingboche(4400m). This is a high altitude village and also the first that is above 4000m. Stopping here and acclimatizing for the journey ahead is recommended. A popular stop for trekkers and climbers headed to Mount Everest, Ama Dablam or ImjaTse, there’s a lot to do here. 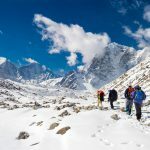 You can take a leisurely stroll through the village or hike to any of the neighboring hills for great views of Makalu, Lhotse, Cholatse, Tawache and Ama Dablam. Next stop is Lobuche(4900m). The trail to Lobuche somehow seems to fool trekkers, first it is a straight open field with huge mountains on all sides and then it starts getting rough. Huge boulders and rocks make the terrain very difficult to walk. En route stop for lunch at the small village of Thukla (4600m). Lobuche is made up of a small number of local homes and teahouses offering basic facilities. The nights are going to get colder, so it is wise to cover yourself up as you are now almost three miles above sea level. Thukla (4600m) is perched on top of a cliff making it almost magical and surreal. The view from here is to die for. There are many memorials built here that is dedicated to the souls that passed away during their attempt to conquer Everest. There is a memorial built for Babu Chiri Sherpa, this one is special because this man not only climbed Everest 10 times but also has a record of fastest ascent of Everest(16 hours and 56 minutes). Not only this, this superman has also spent 21 hours on the summit of Everest without auxiliary oxygen. The next day slowly make your way to Gorak Shep(5140m). Gorak Shep was also the old Base Camp of Everest. From here you can either hike up to Everest Base Camp(5365m) or climb Kala Patthar(5545m). As the popular viewpoint of Kala Patthar lies towards the west the sunset views are pretty amazing from this vantage point. The sun turns into an orange globe just before sunset and lights up the mountains, including Mount Everest in a fiery orange glow. Kala Patthar is the highest point of your trek at 5545 metres. 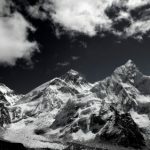 Since the summit of Mount Everest is not visible from Everest Base Camp, trekkers usually hike to Kala Patthar to get a close up view of the world’s tallest peak. Kala Patthar is surrounded by icy walls of Mount Pumori, Everest, Nuptse, Lhotse. Watch the fiery rays of the sun lighting the rocky pinnacle of Mount Everest from atop the Kala Patthar. After this incredible feat and achievement, the next day, slowly make your way down the same trail. You can change the route by coming down to Pheriche and from here it is a comparatively easy downhill trek to Namche Bazzar. Many trekkers stop at Namche Bazzar to celebrate with a few drinks and tell stories of their experience. The next day trek to Lukla, and stay overnight to celebrate your last day in the mountains. Your flight awaits you early in the morning and it will be difficult to leave. As you bid adieu to the mountains, you may never come back to this magical land, but you will definitely take back a sack full of experiences that will be etched in your memory for many years to come. 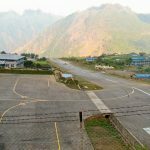 Pranaya – great travel tips. I *really* need to get back to Nepal! Thank you Dave. I will be writing more about the Himalayas and also hope to c u soon here in Nepal.